Today Lily-Ella O’Brien was welcomed at the GSPCA for a behind the scenes tour as a way of thanks for the amazing donation she has given. 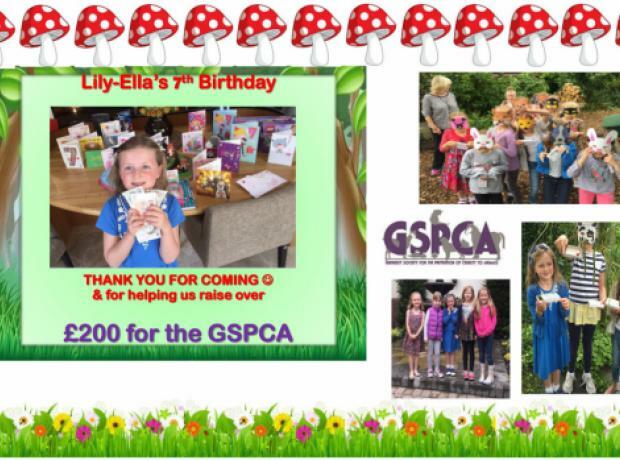 At her recent 7th birthday party instead of presents Lilly-Ella asked her friends to make donations instead of presents to help the animals at the GSPCA. An amazing £200 was raised which Lily-Ella brought up this afternoon and after presenting it to the GSPCA Manager Steve Byrne he then gave her and her grand-mother a guided tour of the GSPCA Animal Shelter in St Andrews. Special guided tour shows off the GSPCA to visitors from the opposite side of the world - would you like to book a tour? On Thursday a group of 4 islanders with 3 visiting family members from Australia had a special guided tour of the GSPCA. The group were shown behind the scenes and learnt from Steve Byrne GSPCA Manager about the rich history of the GSPCA and future plans. From seeing baby birds being feed to young hedgehogs, holding tortoise to seeing Bonnie the seal pup and of course the highlight Olivia the turtle. On Saturday afternoon the GSPCA welcomed another lucky young lady and her friends for a special birthday guided tour of the GSPCA Animal Shelter in St Andrews. Alysia McKane who recently celebrated her birthday with her younger brother and 6 of her friends got to see behind the scenes at the GSPCA and find out about the work of the Animal Shelter. Arriving at 4pm the tour took well over an hour visiting and meeting many of the animals in our care. Scarlett Le Brun who turned 10 on Friday with her younger sister and 4 of her friends got to see behind the scenes at the GSPCA and find out about the work of the Animal Shelter. Arriving at 4pm the tour took nearly 2 hours visiting and meeting many of the animals in our care. Yesterday we saw visitors for the first of the guided tours at the GSPCA for half term with 28 to look around. Sarah Creasey GSPCA Animal Welfare and Education Officer met the group at the front of reception at 2pm to greet them and show behind the scenes at the Animal Shelter in St Andrews. From seeing some of the wildlife to meeting one of the dogs in for a home the group got to see many of the 300 animals in our care.